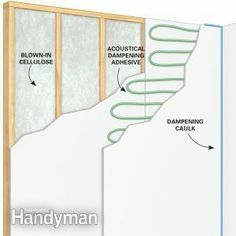 Use double drywall with silicone or sound dampening adhesive. Screws can be used just be sure to have the silicone behind it to limit sound transmission. Roxul Safe 45 is also a great sound dampener. My local Home Depot stores carry this product. I do theaters and soundproofing for a living. for proper soundproofing you need to decouple the ceiling. the second you screw through your sheetrock (even with acoustic glue) into the joists it will transfer to the floor above. I know its hard to believe but its true, even just one screw Doing so will negate all of your efforts for sound dampening. you will want to install the roxul, use decoupling systems for the drywall. The problem is its expensive todo. If you are lucky enough to have the headroom and wall space building a "room within a room" is ideal. you can also use things like z channel or "hat" channel to help further decouple the drywall. also dont forget about the HVAC system, that needs to be isolated as well. best way is to use "dead vents" a substantial amount of sound can be transferred through your HVAC system. 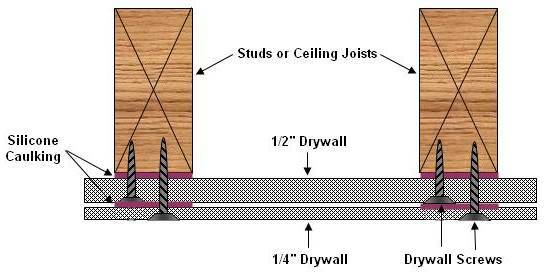 If budget is a concern......use hat channel, two layers of drywall 1 layer 1/2" another layer 5/8" green glue (acoustic glue, its all the same) and take stupid precautions not to drive a screw through the sheetrock into the joists. make sure there is nothing in the ceiling as far as lights/outlets/vents. then use roxul everywhere. hang your lighting and build a wall from the foundation. cement block is a nasty sound reflector. Also hang some acoustic panels up on the ceiling and walls. you can make your own with owens corning 703 and acoustic transparent fabric. Also plan on using a rubber floor, same as the walls you dont want sound reflecting everywhere. Look up theater designs, it will help you out alot. in your diagram with the two layers of sheetrock its absolutely pointless todo so since the screw is going right up through the layers into the joists. no different then just having a regular layer. Also, make sure the room is not a square, you want a rectangle! this prevents the sound from bouncing around (ever wonder why all theaters are rectangle?) also things like an angle wall in a corner, or a bulkhead around the perimeter of the room all helps with acoustics. I'm in the process of deadening my truck, but also toyed with treating my shop and living room. Cost was and issue and so many variables, didn't know where to start - Great write up @3PedalMINI . Lots of good points covered here. Insightful stuff from 3padalmini. Thanks. Pursuant to the room configuration that 3PedalMINI was talking about, there are actually ratios of length x width x height for the best sound reproduction and the elimination of standing waves. you could blow in mineral wool before you cover the existing drywall with a layer of 5/8 + green glue.